In April, my dad gave my sister and I a surprise gift - the Complete America's Test Kitchen Cookbook TV Show Cookbook! I was so surprised and excited to start using this cookbook. Unfortunately, between wrapping up work and moving, I was only able to bookmark the recipes I wanted to try first and dream about making them. I decided my first recipe would be something I knew my dad would LOVE - Key Lime Bars! I finally got to make them for a barbeque at my parents' house Memorial Day weekend. These bars are so delicious and perfect for summer! 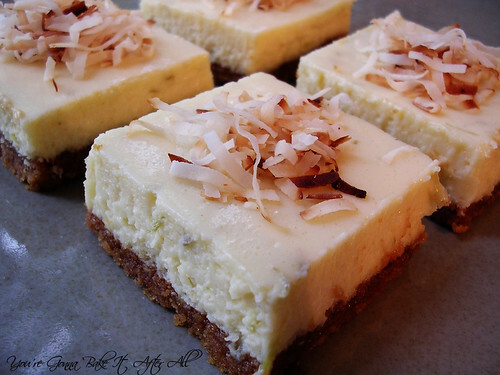 The have a prominent lime flavor that is nicely balanced by the sweetness of the cookie crust. I like the crunchiness of the toasted coconut on top, although some of my family members who don't like coconut chose to have their bars without it. The original recipe makes an 8 x 8-inch pan but states it can be easily doubled and made in a 13 x 9-inch pan. Since I made a double batch, I've provided the recipe for it below. If you make the single batch, just shave a few minutes off the baking time. *I needed about 8 limes, but they were on the small side. 1. Adjust an oven rack to the middle position and heat the oven to 325F. 2. Line a 13 x 9-inch baking pan with a double layer of foil, placed so that the foil extends beyond the sides of the pan to help lift the bars out when finished. Spray foil with vegetable oil spray. 3. For the crust, pulse the animal crackers in a food processor until broken down, about 10 pulses; process the crumbs until evenly fine, about 10 seconds. You should have about 1 1/4 cups crumbs. 4. Add the brown sugar and salt; process to combine, 10 to 12 pulses. If large lumps of sugar remain, break them apart with your fingers. 5. Drizzle the butter over the crumbs and pulse until the crumbs are evenly moistened with the butter, about 10 pulses. 6. Press the crumbs evenly and firmly into the bottom of the prepared pan. Bake until deep golden brown, 18 to 20 minutes. Cool on a wire rack while making the filling. Do not turn the oven off. 7. While the crust cools, in a medium bowl, stir the cream cheese, zest and salt with a rubber spatula until softened, creamy, and thoroughly combined. 8. Add the sweetened condensed milk and whisk vigorously until incorporated and no lumps of cream cheese remain; whisk in the egg yolks (I did this part using my stand mixer with the whisk attachment). Add the lime juice and whisk gently until incorporated. The mixture will thicken slightly. 9. Pour the filling into the crust; spread to the corners and smooth the surface with a rubber spatula. Bake until set and the edges begin to pull away slightly from the sides, 15 to 20 minutes. 10. Cool on a wire rack to room temperature, 1 to 1 1/2 hours. Cover with foil and refrigerate until thoroughly chilled, at least 2 hours. 11. Loosen the edges with a paring knife and lift the bars from the pan using the foil extensions; cut the bars into squares. Sprinkle with the toasted coconut and serve. This is a perfect dessert for the warming weather. What a nice gift your Dad gave you both! I love the idea of using animal crackers for the crust--so yummy sounding! These look so summer-y and I bet they were perfect for the BBQ. What a great gift. Animal Crackers! Cute! I love lime pie/bars/anything! Your bars are so pretty! And they are the perfect summer time dessert! So delicious and refreshing. I'm intrigued by the animal cracker crust. Such a great gift! I couldn't have asked for a more perfect recipe today, especially since I have a huge bag of limes sitting on my counter! oooh these look so good! i love anything lime. and i love the animal cookies for the crust. yum! We are crazy about lime. I love these bars! What a perfect gift! These sound so perfect for a summer potluck and I'm loving the animal crackers in the crust!